Millions of low-income women could lose access to healthcare. The Republican party is following through on its threat to defund Planned Parenthood. House Speaker Paul Ryan announced Thursday that Congress would include a resolution in its bill to repeal the Affordable Care Act that would ban federal money from going to the reproductive health organization. The bill could be voted on within the next few weeks. Planned Parenthood operates 650 health clinics around the country that offer nearly 3 million patients a year a variety of health services including diabetes and cholesterol testing, vaccinations, breast exams, STD testing, birth control, and abortions. The federal budget doesn’t have a special “Planned Parenthood” section in it. Like many health providers, the clinics treat patients who are on Medicaid and then bill the government for reimbursement. 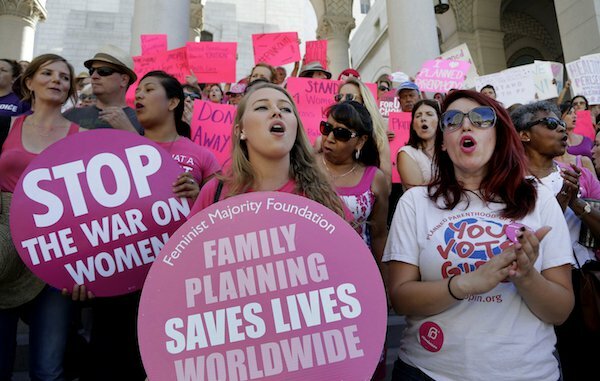 The Republican proposal would ban the government from reimbursing PP for services it provides. And since there is already a law forbidding reimbursement for abortions, the law would merely forbid Planned Parenthood from being reimbursed for all of the other non-abortion services it provides. Planned Parenthood receives about $530 million in Medicaid reimbursements, which accounts for about half of its budget. Without that money, clinics would immediately be in jeopardy of closing, and if they do remain open, prices for services could increase. Nearly 80% of Planned Parenthood’s patients are low-income, many of whom rely on Medicaid to pay their medical bills. If clinics close or raise their prices, these patients could have a tough time finding affordable health care in their communities. If Planned Parenthood is forced to raise its prices for visits or birth control pills, it could lead to poor women not being able to afford the healthcare they need, which could also mean a greater burden on taxpayers’ who have to pay for heftier emergency medical bills down the road. About 75% of Planned Parenthood’s patients receive help to prevent unwanted pregnancies. After Texas defunded Planned Parenthood, a survey of 300 pregnant women who were seeking abortions in Texas said that they were “unable to access the birth control that they wanted to use” in the three months before pregnancy. The state’s health commission predicted that there would nearly 24,000 unplanned births in 2014 and 2015 because of the Planned Parenthood cuts, which could increase taxpayers’ Medicaid costs by $273 million. When Vice President-Elect Mike Pence slashed Planned Parenthood funding as governor of Indiana, it shut down the only HIV testing center in rural Scott County. The PP in the county didn’t even offer abortion services, but was still shut down amid the defunding campaign. Shortly thereafter an HIV epidemic tied to intravenous drug use swept the county. Pence declared a public health emergency in the county in early 2015 and ordered an emergency needle-exchange program.